For some students at the University of Maryland, the magic of Harry Potter doesn’t stop at the movie theater. Some UMD “muggles” are members of the university’s quidditch team, a real-life adaptation of the sport made famous by J.K. Rowling’s popular series, broomsticks and all. Team captain and UMD junior Logan Anbinder said his team mimics the real thing, using brooms and makeshift versions of bludgers, quaffles, and the infamous golden snitch. “We do our best to make it as close as we can to the Harry Potter version without actually flying,” he said. The result is something that looks like a cross between soccer, rugby, and lacrosse, complete with running, throwing and tackling. Just like in real quidditch, “chasers” run down the field to score points in the quidditch hoops. 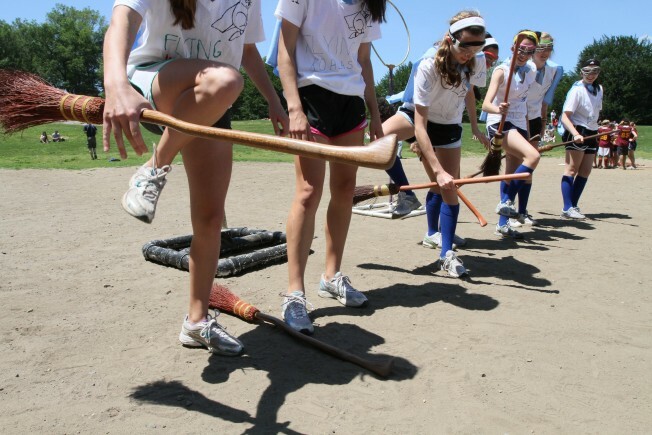 And just like real quidditch, it’s a full-contact sport, and injuries are all part of the game. Some of the team’s members have had broken pinkies, fractured shoulders and even concussions. But unlike Hogwarts, “you can’t just cure them with a bottle of Skele-gro,” Anbinder explains. In fact, most school quidditch teams are so dedicated that they recently asked the NCAA to make qudditch an official college sport. Maryland’s team competes in a league with other colleges and university quidditch teams, and travel all around the region for tournaments. They even went all the way to the national Quidditch World Cup, held last month in New York City. They hold weekly practices on McKeldin Mall, the main quad on the UMD campus, and often draw a lot of attention from students who happen to be walking by. Off the field, the students come from a variety of different backgrounds, majors, and interests. Some played sports in high school, including volleyball, track and lacrosse. But the one thing the team has in common is its love for all things Harry Potter. After practice, one team member served up her own recipe of “Butter Beer,” the drink Harry and his friends enjoy at “The Three Broomsticks” restaurant from the book. So, what Hogwarts house would “The Sorting Hat” choose for Maryland? Their answer -- Gryffindor, “because we’re all honorable and as brave as lions,” said sophomore Patrick Rardin, adding that he thinks Maryland’s archrival Duke University would be Slytherins. While these students may have had to settle for attending the University of Maryland over the Hogwarts School of Witchcraft and Wizardry, they are keeping the magical game of quidditch alive.